Inconsistent build quality and performance across different purchased items. Misleading name hints at higher capacity! 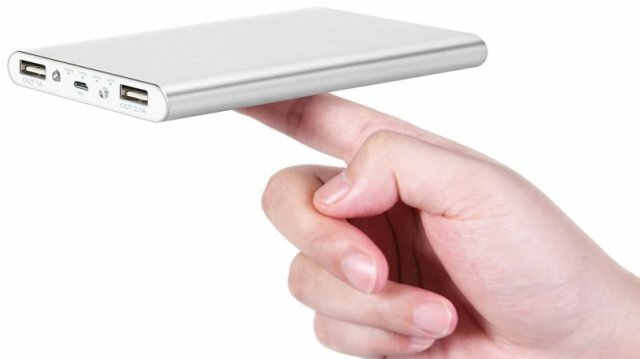 The Polanfo M50000 powerbank combines 12,000 mAH capacity (2 to 3 charges for most smartphones & 4 recharges for iPhone 7) in a very slim and pocketable package (less than half inch thick) at a quite low price. 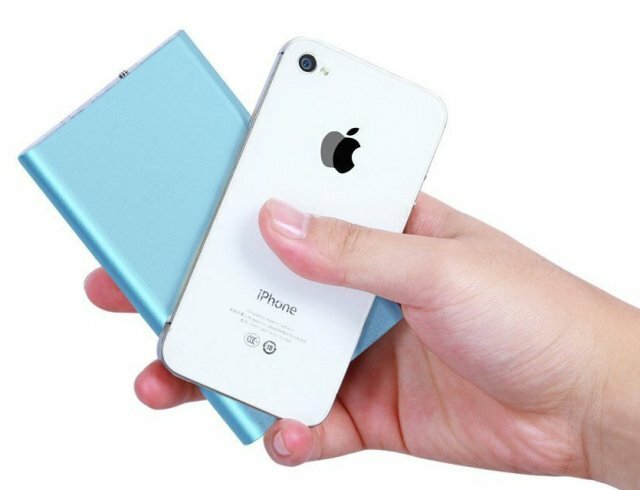 The power bank’s slim and compact design goes well with modern slim phones. The slim design allows you to easily keep it in your pockets – something only very pricey powerbanks can offer. Polanfo M50000 powerbank will give about three complete charges for iPhone 6s and two complete charges for Samsung Galaxy S7/S8. Many vendors on online marketplaces are marketing this 12000 mAH battery bank with claims of a 20000 mAH capacity. Partly, this is because the M50000 name gives a wrong idea about the battery capacity and makes you think it is a 50,000 or 20,000 mah powerbank! There is also a variant Polanfo M20000 in 10000 mAH capacity with same features and same appearance. Polanfo M50000 powerbank is easily one of the most compact power banks in the 10,000 mah category. It has a weight of just 8 ounces (240 grams) and size of 5.6 inches by 2.9 inches with .4 inch thickness. It has dimensions smaller than a typical big screen smart phone and less than half the thickness of typical .9 inch thick powerbanks..
Price-wise, weight-wise and capacity-wise, Anker PowerCore 10000 mAH powerbank is a better choice as it offers higher 10000 mAH capacity at an even lower weight of 6.6 oz (187 grams)!!! The latest version Anker PowerCore 10000 with QC 3.0 output even offers QuickCharge 3.0 output for charging your smartphones to almost 80% capacity in 30 mins, though at a bit higher price. However,thePolanfo M50000 powerbank betters Anker 10000 powerbanks in slimnessand has it a thickness of just .4 inches compared to .90 inches when compared to Anker 10000 powerbanks. This makes Polanfo 20000 half as thick as Anker Powercore 10000 powerbanks and extremely easy to slip in your pockets or the handbag. Thanks to the lithium-polymer battery technology, this mobile battery bank has large charging capacity in a very lightweight, slim and compact package. The lithium-polymer batteries give it a weight advantage of 20-30% over equivalent capacity Li-ion batteries and also offer better long-term battery life. However, the metal edges of this portable battery pack are a bit sharp and, when combined with the all metal construction, can leave scratches on you phone’s screen. 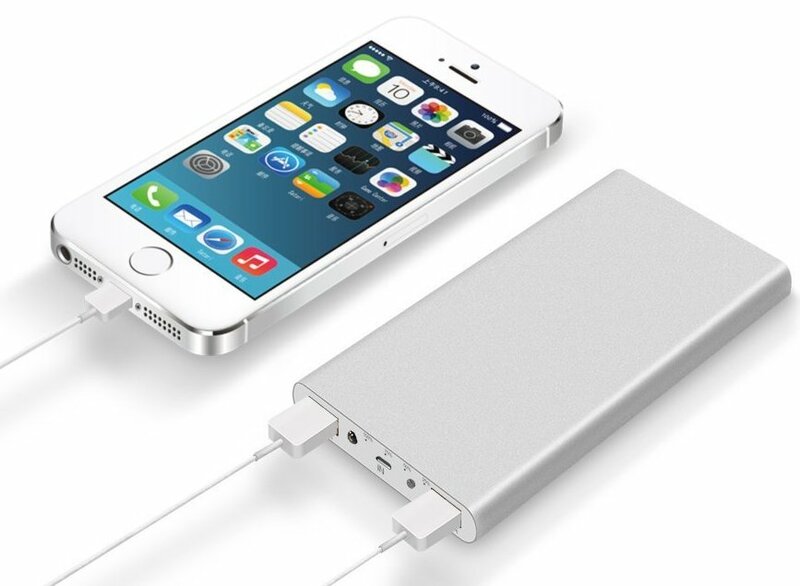 This portable mobile battery pack comes with 2 USB cables – another small but handy plus. The Polanfo M50000 powerbank has one 2.1 A fast charging port and a 1 A standard USB charging port. The fast charging port will allow you to charge your smartphone at about twice the speed of the normal charging port. The power bank has a sturdy Aluminium construction, which when combined with its light size makes it very rugged as well as good looking. A bright LED flashlight further adds to the functionality- a small but handy feature in emergency situations. The massive battery capacity means that as a flash light it will go on for days. Most power banks come with 1 year warranty. The better ones come with one and half year warranty. The 5 year warranty of Polanfo M50000 powerbank may indicate confidence of the manufacturer and the seller in the quality of the product. However, the shady capacity claim does cast a cloud over the manufacturers integrity. Over the last few years, we have also seen the brand/manufacturer completely disappearing online (!!) which means one can’t really trust the brand to be around to honor the warranty! Polanfo M50000 powerbank is available in six colors – Silver, Gold, Blue, Pink, Black, Gray – giving lots of style options. In case you are wondering, this portable mobile charger does not come Qualcomm Quickcharge for ultra-fast charging and pass-through charging which lets you charge devices as the power bank itself is being charged. However, this is not a big worry given its modest 8000 capacity. The integrated fast-charging port (2.1 A) offers twice the speed of normal (1. A) charging ports and charges it in 4 hours! No slim or ultra-compact powerbank, even from other manufacturers, offers these features and therefore it is not really a concern. Please note that you will need a 2 Amp wall charger such as Anker 24 W dual USB wall charger or Aukey dual USB wall charger to charge this powerbank in half the time (4 hours) than normal. A latest Quickcharge 3.0 charger such as the Aukey dual USB port QC 3.0 will also charge it in 4 hours through automatic adaptive charging. In case you are wondering why we only mention dual port chargers: We always recommend buying a dual port charger as it allows you to charge both your phone and powerbank at once from the same power outlet! This feature can be very helpful in places such as airports, during travel, and hotel rooms where power outlets are rare. Also, most modern power banks do not offer pass through charging anymore as it damages the battery and reduces battery-life. While an Amazon rating of over 4.1 from 300+ reviewers indicates a somewhat OK product, we have seen the brand completely disappearing and appearing again over the last 2-3 years and also received disproportionately high complaints regarding the products from the users when compared with other powerbanks. The 5-year warranty and good reviews for the warranty cannot exactly be a substitute for a customer of the Polanfo M50000 powerbank. The hassle of return and shipment of a low-cost defective powerbank just not worth the effort. However, that said, the Polanfo M50000 powerbank external battery is value for money, but in the end, all things considered, we will recommend avoiding it. Till then, we recommend that you are better off buying a reliable products from the likes of Anker, RAVPower, EasyAcc, or Aukey such as EasyAcc 10000 powerbank, Anker PowerCore Slim, Anker PowerCore 10000, or RAVPower 10400, or Aukey 10000. I got this for Christmas 2016. If it has a five year warranty, where do I send it? It’s not taking any kind of charge. Thank you. It seems that the shady company behind the brand has now completely disappeared. We had rated it very low because of the powerbank’s complete lack of reliability and shady customer support. Your powerbank, unfortunately, is most likely a brick now. Please dispose it as a hazardous object at a hazardous waste collection point (you can ask your local landfill). You can also locate your nearest battery recycling drop off location at this link. Hi Michael, After remaining connected to the AC outlet for the whole night, the 20000m must get fully charged. How many lights were lit up when you finished charging the powerbank? If none or just one, then try recharging it again from a different outlet and check if all the four lights get lit up on the powerbank getting fully charged (in 6-10 hours depending on your wall charger). Also, how many lights are constantly turned on and how many flicker when you connect the phone for charging? It is okay for the powerbank lights to turn off after some time, you do not have to keep turning the lights on. Just check if the phone’s battery is getting charged when the lights are off. If not, then get the powerbank quickly replaced! Also we hope that you have bought it from a reputed dealer such as Ronnie Tech as lots of questionable sellers also sell this product. Here is the link for purchasing Ponafo 20000m from our recommended seller Ronnie Tech . The same thing has happened to me. I got this for my birthday on August 5th and I’ve used it twice. Today, after leaving it charging all night, it won’t even hold a 25% charge. I’m very upset and disappointed in this product. Hi Mary, Most likely you have received a defective product. This is usually the catch with low-cost Powerbank suppliers like Polanfo as the quality is not consistent as the established brands such as Anker or RAVpower.. However, Polanfo fortunately has excellent replacement policy and we suggest that you quickly report and seek a replacement or return for your powerbank.